Hendrix was not very popular in the U.S.A. at the outset of his musical career, only later gaining recognition after taking a trip to England in 1966 with The Animals' Chas Chandler, where he subsequently formed The Jimi Hendrix Experience with bassist Noel Redding and drummer Mitch Mitchell. While The Experience quickly became popular in England, they remained relatively unrecognised outside the country. It was not until their 1967 performance at the Monterey International Pop Festival in the States that The Experience became, quite literally overnight, one of the most popular bands of the era. Hendrix was mostly self-taught on the guitar. He was ambidextrous but chose to play the guitar upside-down and re-strung for playing left-handed, which suggests that he was more comfortable left-handed. As a guitarist, he built upon the innovations of blues stylists such as B.B. King, Albert King, Buddy Guy, T-Bone Walker, and Muddy Waters, as well as those of rhythm and blues and soul music guitarists such as Curtis Mayfield. Hendrix's music was also influenced by jazz; he often cited Rahsaan Roland Kirk as his favourite musician. In addition, Hendrix extended the tradition of rock guitar; although previous guitarists, such as The Kinks' Dave Davies, Jeff Beck, and The Who's Pete Townshend, had employed techniques such as feedback, distortion and other effects as sonic tools, Hendrix was able to exploit them to a previously undreamed-of extent, and made them an integral part of his own private, unique genre, which he called "Red". 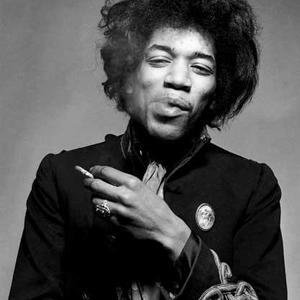 Jimi's father Al Hendrix is credited as the one who gave Jimi his first real guitar, and (less positively) for claiming posthumous copyright ownership to suppress the publication of, for example, a live collaboration album between Hendrix, Jim Morrison, Buddy Miles, and Johnny Winter. Earlier, the two would have jam sessions with Al on either bass or saxophone. As a record producer, Hendrix was an innovator in using the recording studio as an extension of his musical ideas. Hendrix was notably one of the first to experiment with stereo effects during the recording process. Hendrix was also an accomplished songwriter whose compositions have been performed by countless artists. At Woodstock, Larry Lee was a member of Hendrix' Band of Gypsys, and also played a Gibson Les Paul Studio model and sung with Hendrix as well. Many people thought Jimi was playing guitar alone, but the late, great Larry Lee assisted him in the Woodstock guitar performances. The Hendrix sound combined high volume and high power, feedback manipulation, and a range of cutting-edge guitar effects, especially the UniVibe-Octavia combination, which can be heard to full effect on the Band of Gypsys' live version of "Machine Gun". He was also known for his trick playing, which included playing with only his right (fretting) hand, using his teeth or playing behind his back, although he soon grew tired of audience demands to perform these tricks. While he may have dominated loud electric guitar, there was another side to Hendrix's music. On songs such as "Little Wing", "Angel", "May This Be Love" and "Castles Made Of Sand", he showcased his more gentle side with more tender guitar playing and lyrics.